If you don’t want to open any certain website on your computer, you can block that site by making a little change in Windows’ “hosts” file. It is the easiest way to block a website.Now you might be thinking that what is the hosts file and where it is placed in Windows 7? So, don’t worry dear friends! I will tell you the complete and step by step procedure to block a website on your Windows 7 computer. Before illustrating the complete procedure, I would like to tell you that how is it helpful to you…. By blocking a website parents can prevent their children to open websites which can leave the wrong effect. It may be helpful in many Institutions and Organizations to don’t distract student’s mind from the study. First of all you have to reach to “hosts” file by following the address >> C:\Windows\System32\drivers\etc. Remember that this address is for Windows 7. Now right click on “hosts” and select Properties. A window named “hosts Properties” will appear in front of you. Select Security and then select Users. Click Edit. In the next window “Permissions for hosts” again select Users and Check all the options except “Special Permissions” to allow permissions and then press OK.
After that click on Advanced and then click on Change Permissions in the next window. In the next window of “Advanced Security Settings for hosts” select Users and click on Edit. 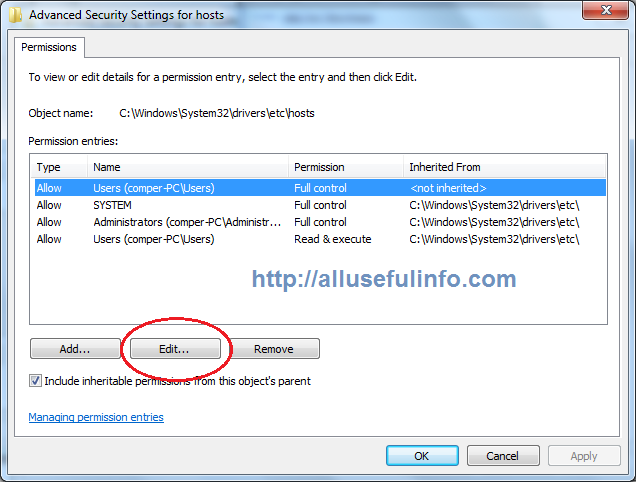 Select all the options in “Permission Entry for hosts” window and then Press OK button of all windows. Dear friends! We are going to reach to the final step. Now open the hosts file by double clicking on it with a suitable text editor like Notepad. Now you will see the following encrypted file. Point your cursor after the last word of the last line and hit Enter. To block a website type 127.0.0.1 and give the single space and write the name of the website as 127.0.0.1 www.yahoo.in. So we have done!! Now try open these websites in any browser. The web browser will not open the blocked websites. I hope the article will help you to block websites in Windows 7 computer. It will be supportive to anyone.Thanks Raman. I cannot get a specific website to block using notepad. I’ve tried numerous times with no success. I blocked others the same way and it worked right away. What do yo think is wrong? Some sites may cause problem in blocking using this method such as Facebook. So, if you’re feeling problem in blocking a specific site using Notepad, then I recommend you to go through a site blocking software like K9 Web Protection and many software on the web for blocking different type of websites. Hope that helps, Keep visiting. i’m having small internetcafe. in that i blocked (www.facebook.com) some websites but some users opening the (www.m.facebook.com) sites.. with changing the settings. I want fully blocking website method. they are not opening that one if any changes may be done. i want keyword blocking in the system. help me. how to block the keyword(face book) in system.